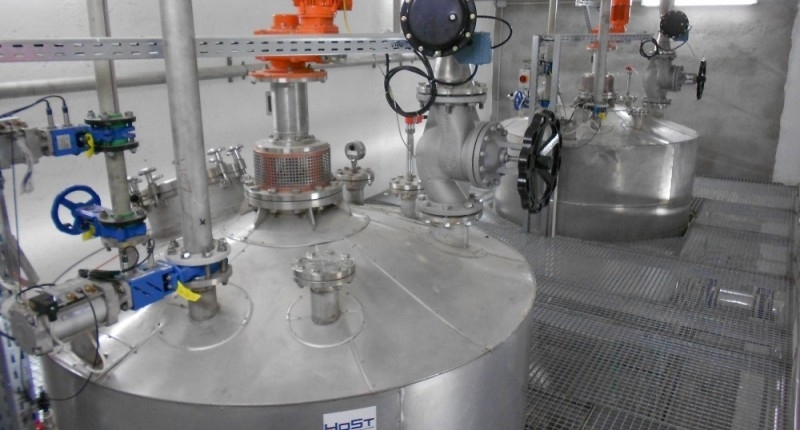 HoSt supplies Thermal Pressure Hydrolysis (TPH) plants. The goal of a TPH system is to improve the biodegradability of organic material. By using thermal pressure hydrolysis, structures that are normally hard to convert by bacteria, such as lignin in plant material and cells in sludge can be converted. This breakdown step makes the organic matter more available for the bacteria. Because of TPH, this improves the material conversion rate and increases biogas production. In a thermal pressure hydrolysis installation, material is heated up to 140-180°C at a pressure of 4 to 10 bar, by the use of steam injections. After a retention time of 20-40 minutes, the material is flashed. The flash vapor is recovered to minimize the energy consumption. Reduction of the viscosity of sludge (DM in digester to 12% DM), this allows a larger input stream. The increased biogas production and re-using the heat from the flash vapour lead to a positive energy balance. The energy production is higher than the energy costs. TPH leads to a faster conversion, a faster conversion allows for a smaller digester or a larger input stream. Interested in our Therman Pressure Hydrolysis technology or do you want more information? Please contact us.